One day, out of the blue he just showed up! Looking very different from all the other stray cats in the area, he was trying to survive on scraps of food from the garbage cans. Saint Francis Society Animal Rescue arrived at the scene to check on this strange cat and evaluate his needs. He had been seen near an apartment complex, no one in the area had ever seen him before? Someone spotted the cat and the “Cat Man,” Chris arrived. There were too many people for the strange cat’s comfort, he refused to come closer, even when food was placed before him. He was clearly in discomfort and a lot of pain, so Chris decided to come back the next day and see if he could trap him. The next day Chris returned and set a trap, with fewer people around the cat’s hunger overcame his fear and entered the trap and ate the food Chris had set as bait. 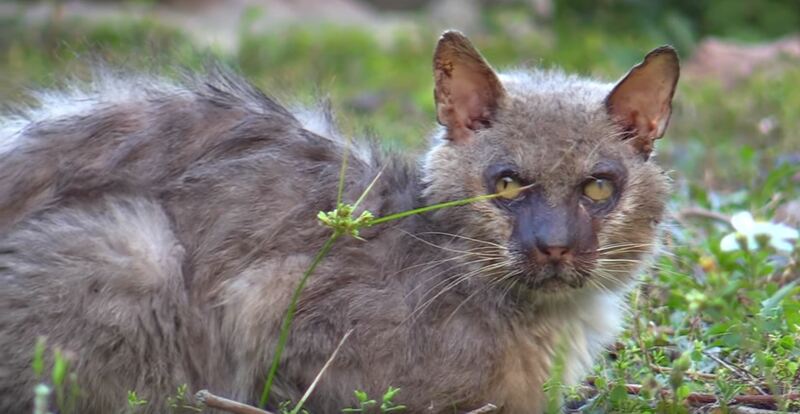 Upon closer inspection it was clear to see this was nothing other than the extremely rare “Werewolf” Cat, you can find out more on this rare breed here. TO SEE THE FULL VIDEO OF THIS RARE RESCUE CLICK NEXT BELOW! Watch This Home Alone Kittens Reaction When Her Humans Finally Come Home. Wait For It.